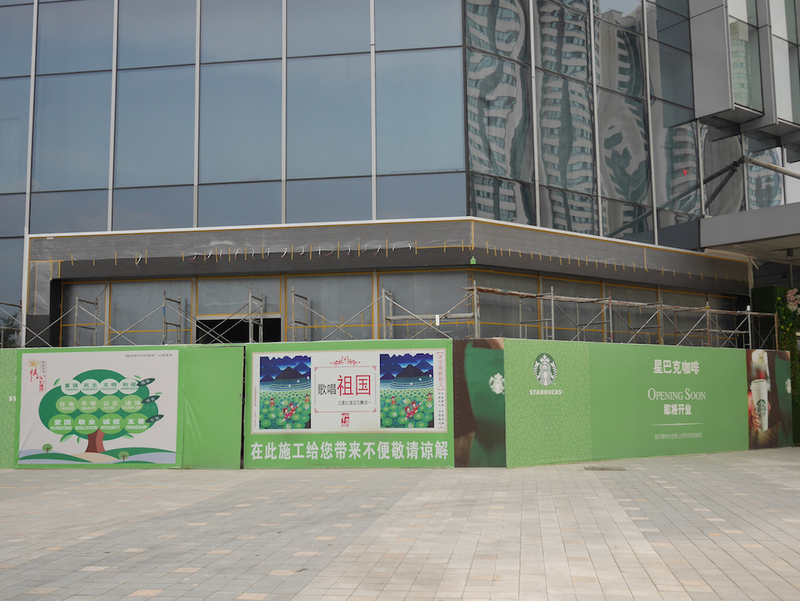 For several weeks, the status of the second Starbucks in Bengbu hasn't been clear. 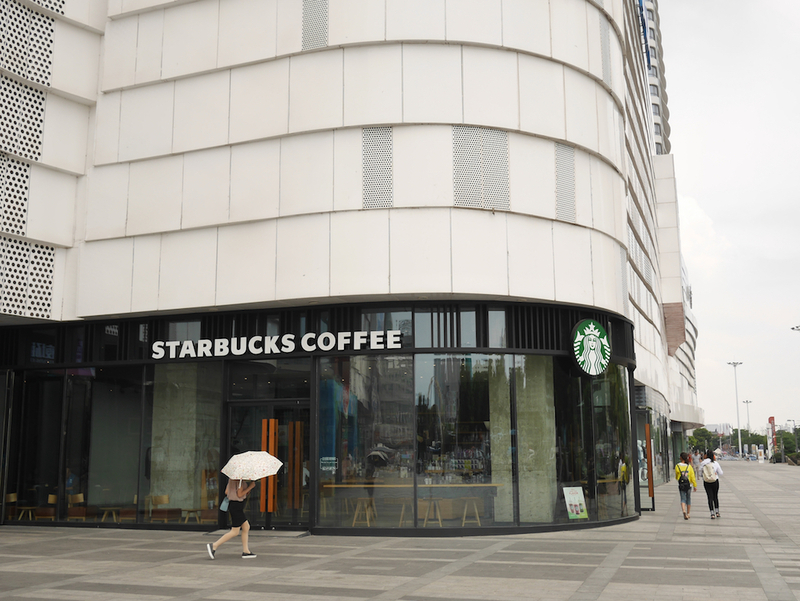 This afternoon I had reason to stop by the Intime City (银泰城) shopping center and discovered the store is now finally open — part of Starbucks opening more than a store a day on average in China. I didn't have plans for a caffeine boost, but I decided to check things out and immerse myself in the experience. Staff excitedly told me it was their first day of operations. 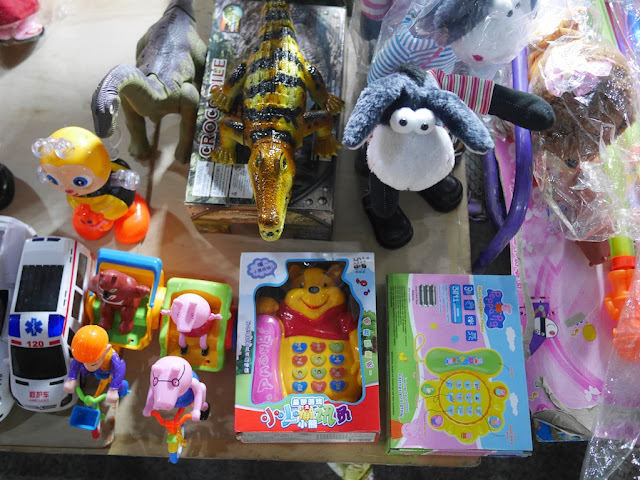 They hadn't opened earlier because some supplies and equipment hadn't yet arrived. As at Starbucks elsewhere in China, many of the staff wore name tags displaying English names. Typically some of the names are more creative and wouldn't be common in western countries. The name used by the young woman who took my order fit in this category. In short, the coffee tasted just like the coffee at the Starbucks 1000 meters down the street and other Starbucks much farther away. 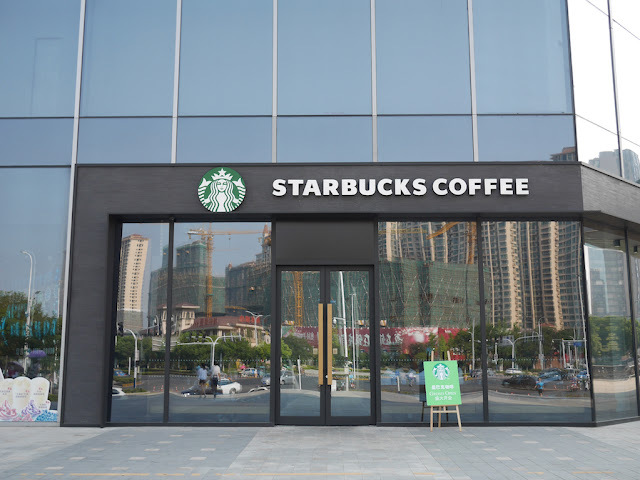 Although at the moment this location doesn't appear in the store finder for Starbucks in China, it seems safe to say the store isn't a fake. It was about one third to one half full of paying customers while I was there. At times there was a line at the counter, but at other times you could roll right up to place an order. While this Starbucks reflects Bengbu's recent growth to a degree, what's reflected off of the front of the store will say more about Bengbu's future. Many residential and commercial building projects are currently underway in Bengbu. Many, many, many. 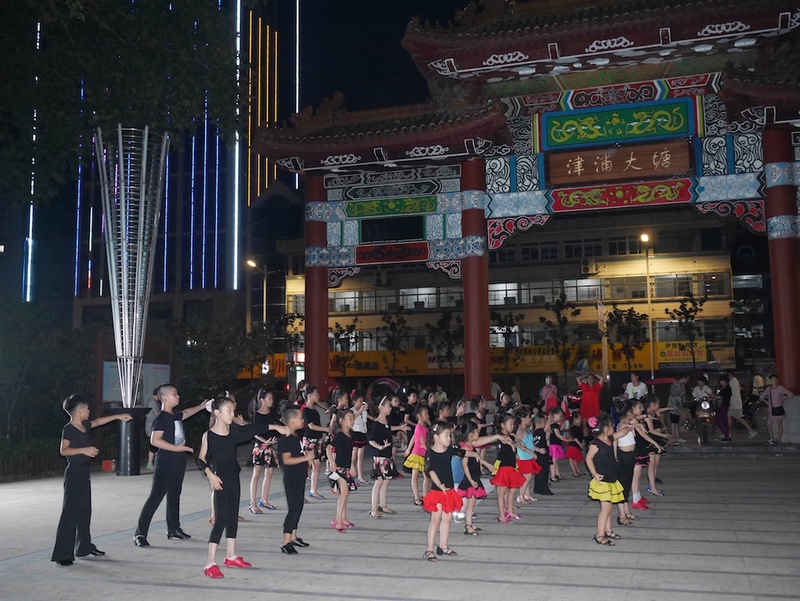 They raise serious questions which also apply to other cities in China. More about that later. 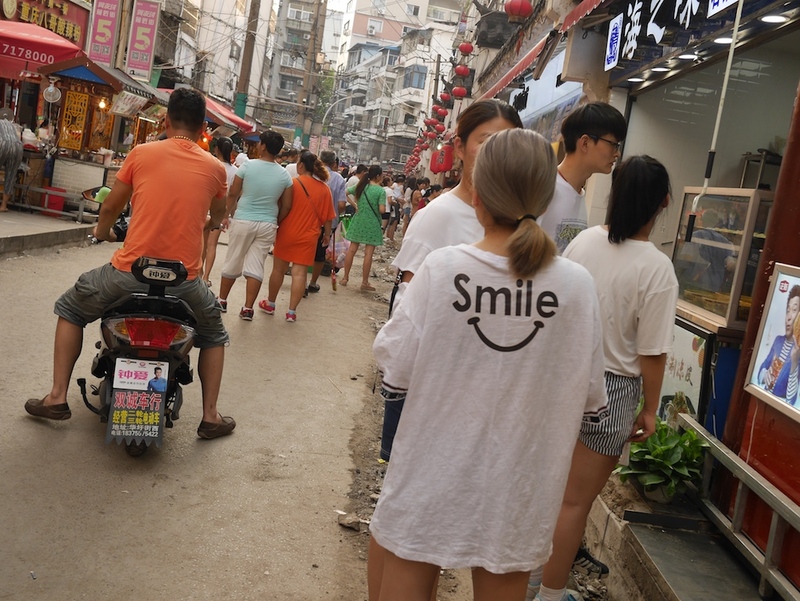 Both of these photos were taken on Huali Street (华利街), which at times is packed with street vendors selling a variety of food. More about some of the life there another day. I have been thinking a lot about Liu Xiaobo, the possibility VPNs will soon become much more difficult to use in China, and China's expanding censorship. For now, something on a lighter and cheerier note . 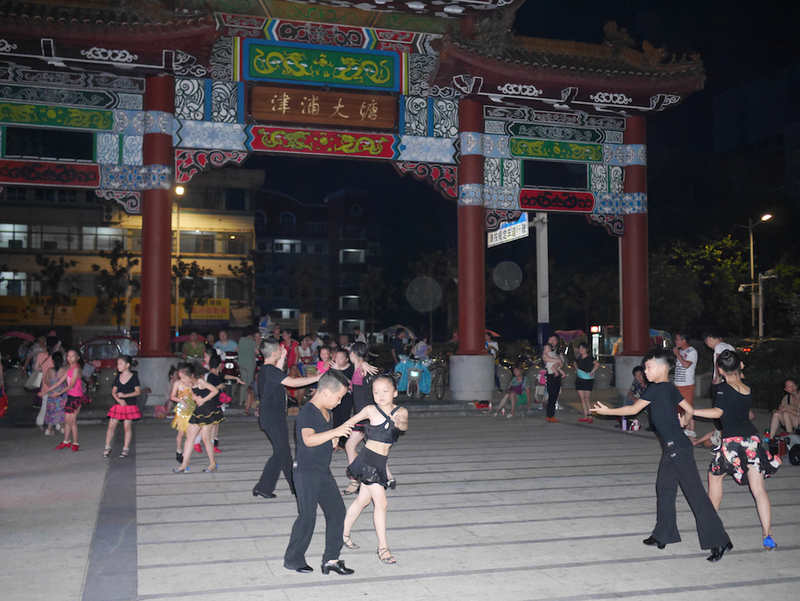 . .
People dancing in groups at parks is a common sight in much of China. Most of the time it doesn't involve children dancing in the dark though. 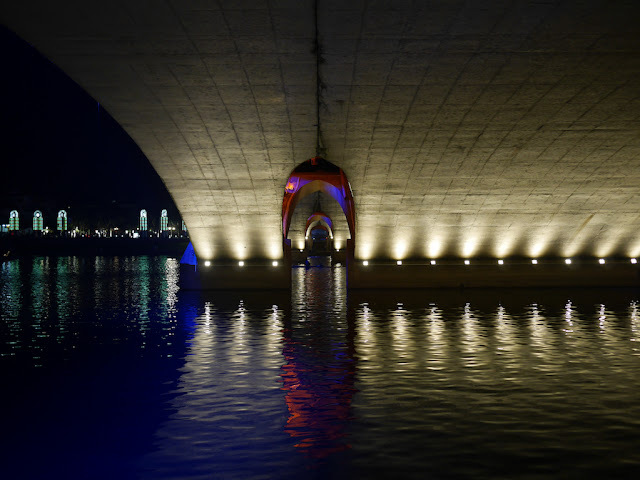 So below are a few photos taken after 9 p.m. this past Wednesday and Thursday at Datang Park (大塘公园) in Bengbu. 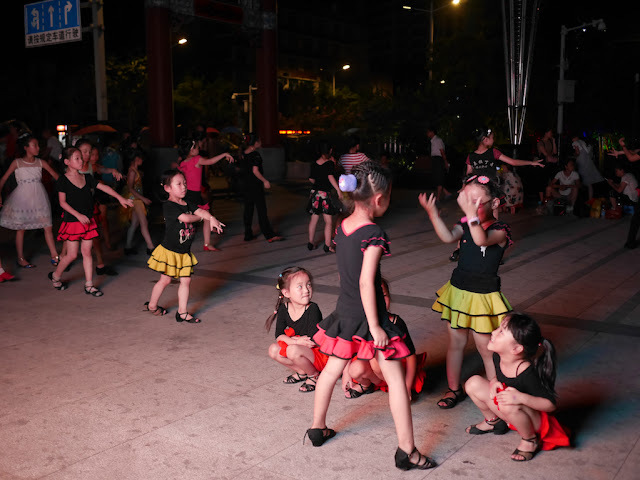 During my brief time watching, the children appeared to be dutifully following the dancing program, though at least once a few separated out to do their own thing. 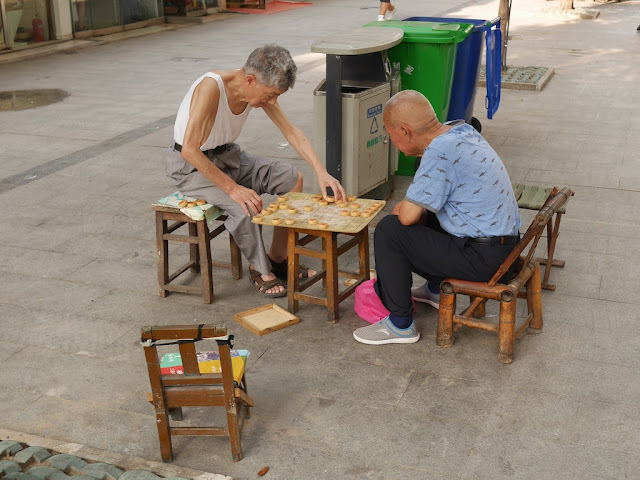 One day before the death of human rights activist and Nobel Peace Prize winner Liu Xiaobo, I serendipitously met a friendly married couple in Bengbu, Anhui province. They have a little girl and both are highly-educated professionals. Upon learning my nationality, one of them said, "I like the US." When I asked why, he replied, "Democracy". So I asked what he thought about Liu Xiaobo, who had sought a democratic China. After repeating Liu Xiaobo's name several times in apparent bafflement, he said he didn't know who I was talking about. I didn't pursue the matter as we walked into a small crowded local restaurant known for its wontons. The following are excerpts from three recent pieces well worth reading in full. They say much about Liu Xiaobo, the reaction to his death, and a conversation I had in Bengbu that could have occurred in many other places in China. Most Chinese have never heard of Liu Xiaobo, because the state propaganda apparatus has suppressed discussion of him. Thus the paradox: The first person to win a Nobel for work in China has died, and he is little mourned in his own land. Yet for those of us who followed his extraordinarily important and courageous work over the decades, there is a great sense of emptiness and sadness—not so much sadness for Liu himself, who is now free of persecution, but sadness for China’s backward march and sadness for the timidity of world leaders at the brutalization of one of the great men of modern times. There is so much we can learn from Liu’s courage, decency and vision, and some time I look forward to placing flowers at the memorial to him at Tiananmen Square. Wu'er Kaixi in "Murdered but Undefeated"
During [the Tiananmen Square protests], I was to talk to US broadcaster Barbara Walters. Liu Xiaobo was my advisor on almost everything I did during the protests of 1989, and he helped to prep me for the interview. I was shocked. In China, you did not tell the truth. 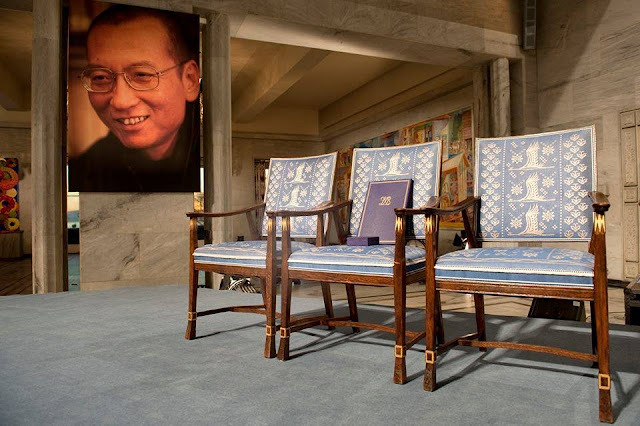 "As a tribute to the absent Nobel Laureate, Liu Xiaobo's Nobel Medal and Diploma were placed on an empty chair during the Nobel Peace Prize Award Ceremony in Oslo, Norway, 10 December 2010. Photo: Ken Opprann." Incredibly sad in so many ways . . .
Liu Xiaobo, the renegade Chinese intellectual who kept vigil on Tiananmen Square in 1989 to protect protesters from encroaching soldiers, promoted a pro-democracy charter that brought him an 11-year prison sentence and was awarded the Nobel Peace Prize of 2010 while locked away, died on Thursday. He was 61. . . .
Mr. Liu’s illness elicited a deluge of sympathy from friends, Chinese rights activists and international groups, who saw him as a fearless advocate of peaceful democratic change. He was the first Nobel Peace laureate to die in state custody since Carl von Ossietzky, the German pacifist and foe of Nazism who won the prize in 1935 and died under guard in 1938 after years of maltreatment. Liu Xiaobo's absence from the Nobel Peace Prize award ceremony was marked by an empty chair. We now have to come to terms with the fact that his chair will forever remain empty. At the same time it is our deep conviction that Liu Xiaobo will remain a powerful symbol for all who fight for freedom, democracy and a better world. He belongs to a heritage of former Nobel laureates such as Carl von Ossietzky, Martin Luther King, Jr., Andrei Sakharov, Lech Walesa, Aung San Suu Kyi, Nelson Mandela and Shirin Ebadi, to mention a few. At the end of June the news reached us that Liu Xiaobo had been released from prison. He had been transferred to hospital, but was still under guard and held in complete isolation. We find it deeply disturbing that Liu Xiaobo was not transferred to a facility where he could receive adequate medical treatment before he became terminally ill. 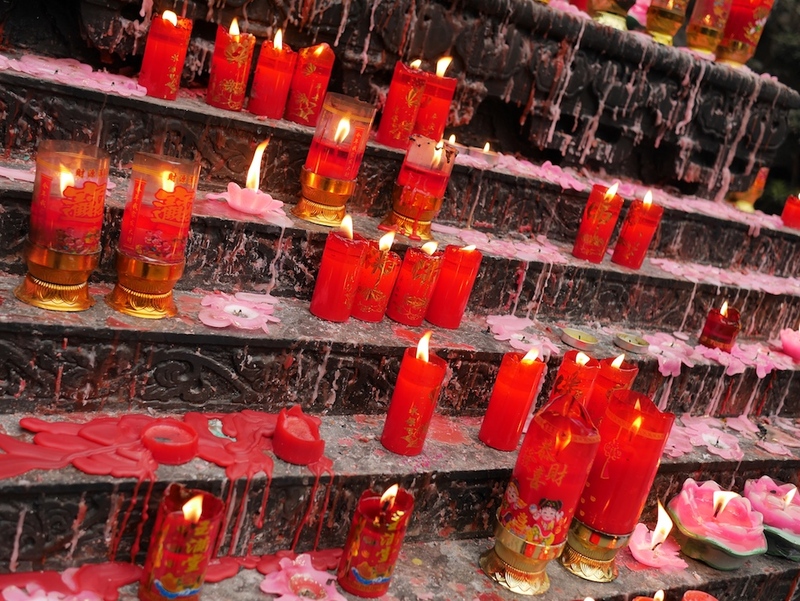 The Chinese Government bears a heavy responsibility for his premature death. The news of Liu Xiaobo's serious condition was met in part with silence and belated, hesitant reactions world wide. Eventually the governments of France, Germany, and the USA called for his unconditional release, as did the EU through its foreign policy spokesperson. It is a sad and disturbing fact that the representatives of the free world, who themselves hold democracy and human rights in high regard, are less willing to stand up for those rights for the benefit of others. Freedom is at the core of universal human values. Freedom of speech, freedom of the press, freedom of assembly, freedom of association, freedom in where to live, and the freedoms to strike, to demonstrate, and to protest, among others, are the forms that freedom takes. Without freedom, China will always remain far from civilized ideals. 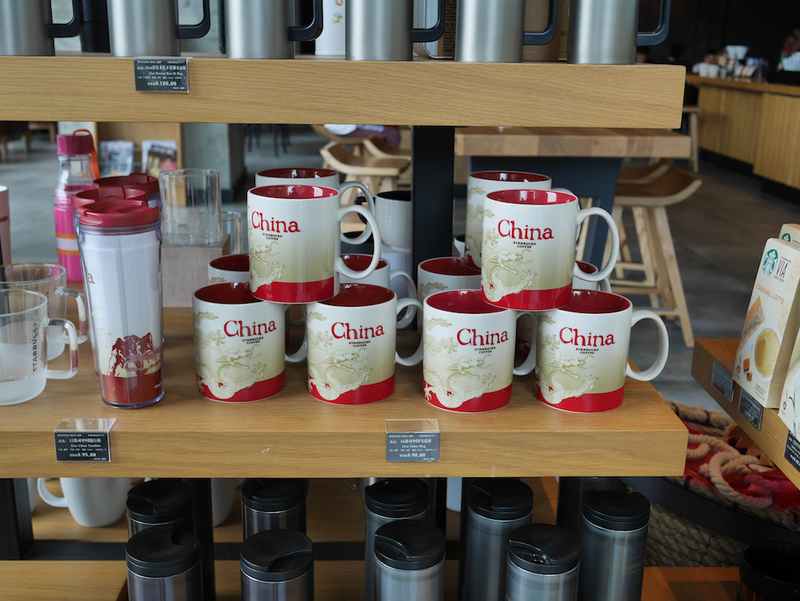 I have been to a number of cities in China where Starbucks can't be found, such as Ganzhou, Mudanjiang, and Shaoguan. 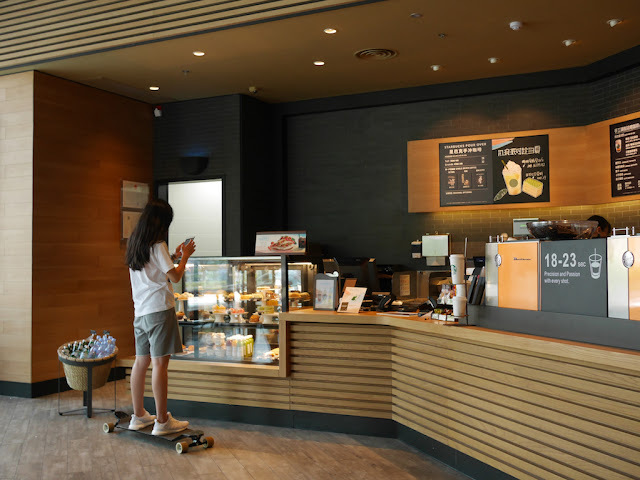 Yet Starbucks' growing reach in China has been readily apparent, whether by coming across their first stores in cities such as Hengyang, Kunming, and Xiangtan or knowing they have opened in cities such as Lanzhou, Yanji, and Zhanjiang since I last visited them. Loosely based on these experiences, when I recently arrived in Bengbu I didn't expect to find a Starbucks here. I didn't even bother to check if one existed. But I still found one. 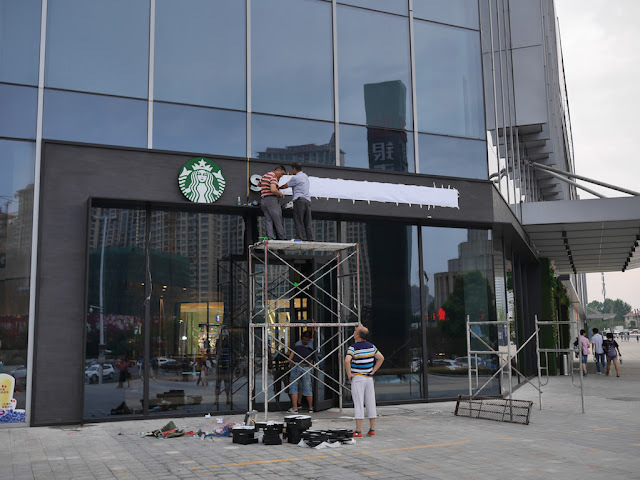 Prominently situated at the Wanda Plaza (万达广场) shopping center, the store opened about six months ago. For those now thinking of making a pilgrimage to Bengbu for mug, a warning: unlike many places elsewhere in China, no city-specifc mugs are available at the moment. 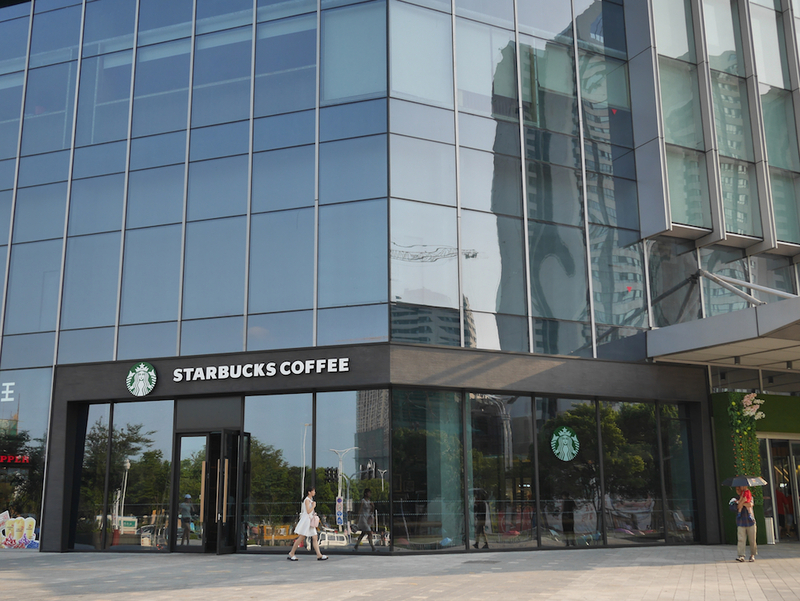 Soon after finding this Starbucks, I saw that another Starbucks will open only 1000 meters away at the Intime City (银泰城) shopping center. Five days ago I watched workers place the letters for the storefront sign. Since then, the state of the store hasn't been as clear. The outdoor coverings are gone and there is nothing external to indicate the store isn't open. Sometimes, as in the above photo, the door is even left open. This seems to scream "we're open", but they aren't. I have seen multiple people approach the outside door only to find it locked or to open it and discover a Starbucks with a ladder standing in the middle of the floor, empty shelves, and no baristas at work. This experience doesn't strike me as what Starbucks should want to deliver. 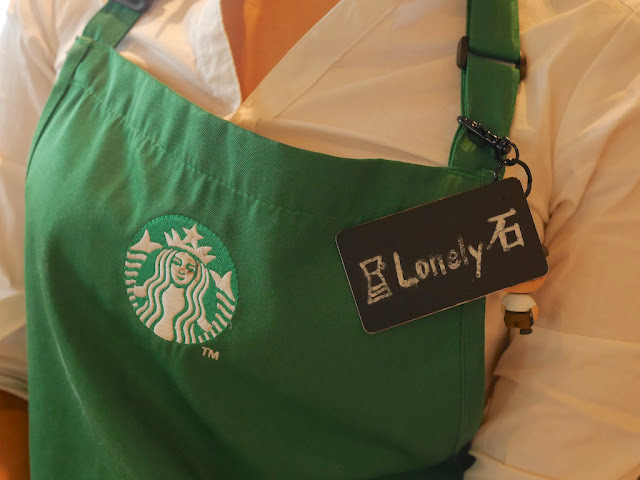 When I asked a Starbucks employee at the other store when the Intime City location would open she said she wasn't sure and suggested I wait a bit. 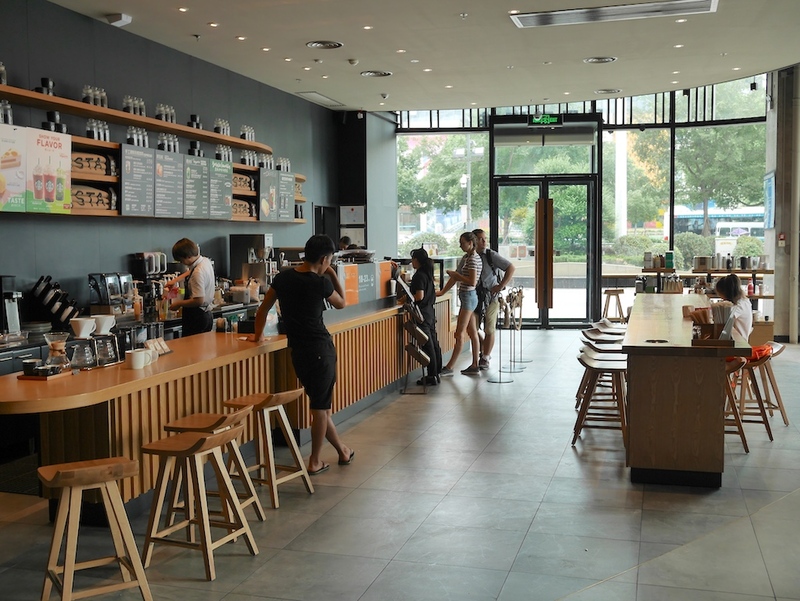 Whatever the story, the already-open Starbucks seems to be doing well and presumably, someday, the other will open as well. It isn't obvious whether this says more about the growth of Bengbu, which like many Chinese cities has undergone much change over recent years, or Starbucks, which also has stores in nearby cities including Hefei, Suqian, and Xuzhou. But both Bengbu and Starbucks appear to be enjoying the arrangement. A Werner Herzog quote at the movie theater in Bengbu appeared to a be relatively clear case of what can happen when one attempts to translate translation back into the original language. Figuring this out was especially satisfying because often when I attempt to track down the source of English that for one reason or another catches my attention in China I feel like I am going down the rabbit hole. I didn't understand the message, but perhaps nothing is wrong with the English. Poetry often involves creative language usage that wouldn't typically be considered grammatical or is not transparent in meaning. I was curious to see if I could sort this out. An online search for an exact match to the message came up empty. But I did find an online site selling the same decal. 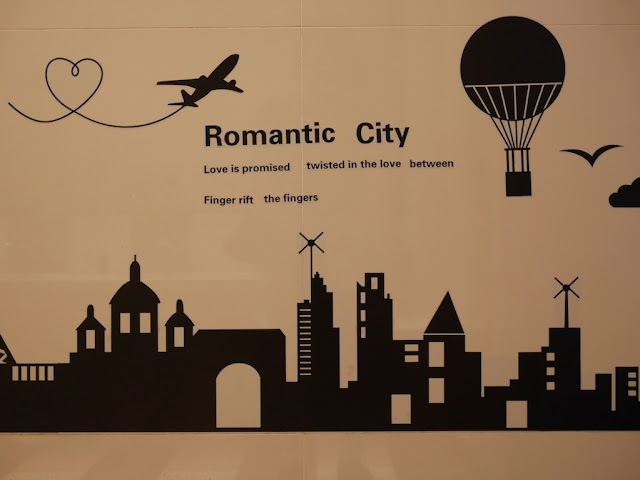 They display it with the words in a different order. Sometimes the list of quotes is described as "classical English" and some of the other quotes are recognizable or similar to other familiar quotes. Elsewhere online, it isn't hard to find examples elsewhere of people asking in Chinese about the meaning of the English version. Typically somebody replies with the usual Chinese version without any further commentary. Despite trying several different approaches, I have gotten much further than this. I couldn't find any attribution for the quote in either Chinese or English. 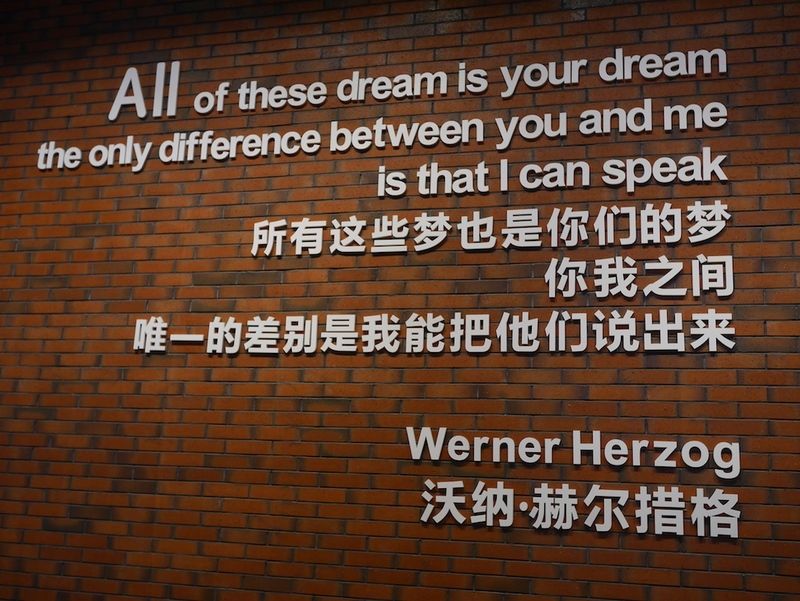 And while I wonder whether something happened similar to what happened to the Herzog quote, I don't even know in which language the quote originated. So if you can catch this rabbit, please let me know. And finger rift, the fingers . . . It's not only my dreams. My belief is that all these dreams are . . . are yours as well. And the only distinction between me and you is that I can articulate them. Now I'm looking forward to watching both the documentary and the movie. So, thank you, Dadi. So this is out of left field (pun intended), but a lecture by David Tong distracted me from my original plans for today's post. The lecture is primarily targeted for people who want to learn about the latest scientific theories of the universe's building blocks without getting into much or any math. Most of what he presented was already mostly familiar to me, but I was intrigued by his spin (once again, pun intended) on some topics and enjoyed how he made a compelling story out of complex ideas. Tong's response to the first question led me to looking up and reading his paper "Physics and the Integers" which expresses the viewpoint that at a fundamental level the universe is continuous, not discrete. Cool stuff. Two days ago in Bengbu, a city in China's Anhui province, I spent the evening trying to celebrate the Fourth of July. 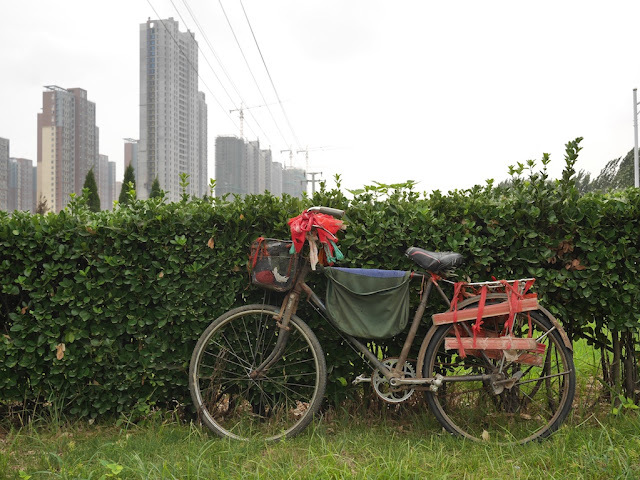 Like a big part of my reasoning for choosing to visit Bengbu — appreciating the sound of its name — I saw it as a way to mix things up and learn things I may not have otherwise learned about China. I don't have as much of a story to tell about the night as I did a few years ago for a Fourth of July in Hengyang, Hunan. And while I did find much of interest, it would make more sense to share most of it in other contexts. 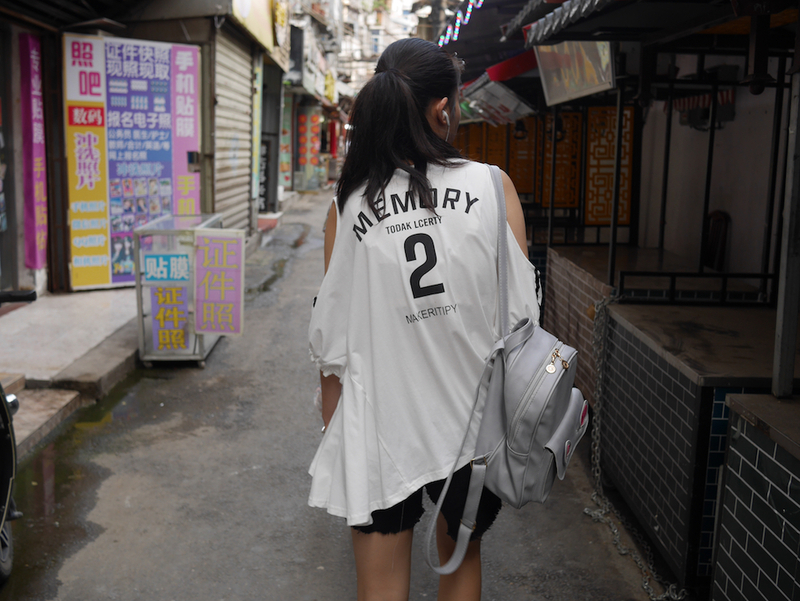 Still, I have a bit of story . . . The night started more fittingly than I could have ever reasonably expected. 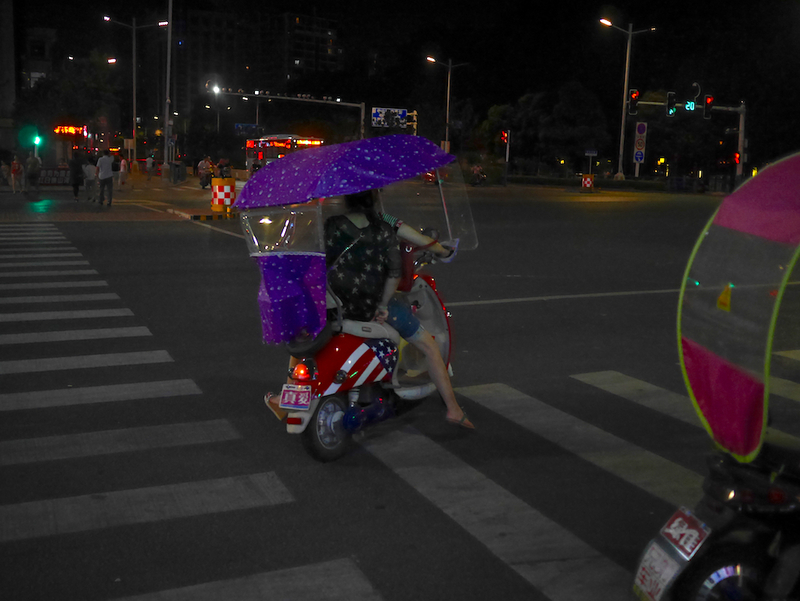 Seconds after heading out, I saw a Stars & Stripes themed motor scooter driving off. While I have seen scooters with an American flag design in China on occasion before, including one other in Bengbu, the timing here was wonderful. This really happened. 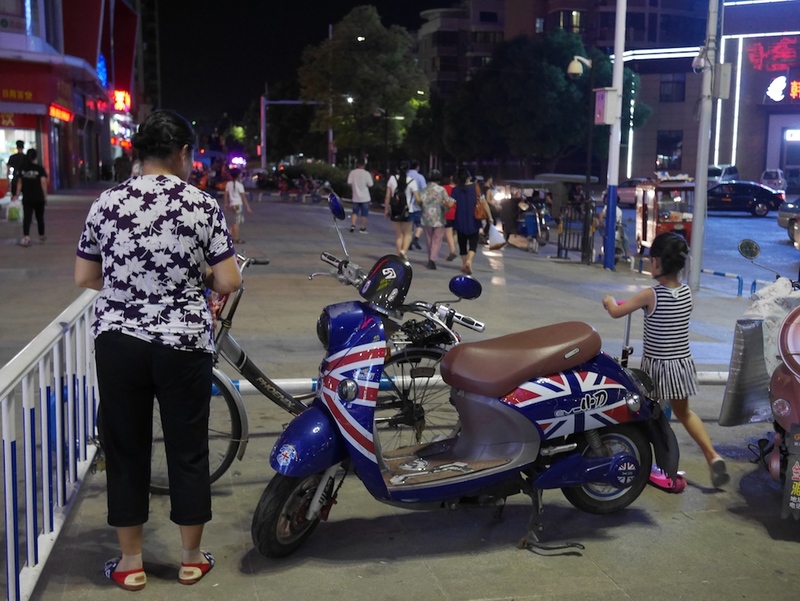 Later in the evening, I saw a scooter with a design seemingly inspired by a country who played a large role in making the Fourth of July happen. I see these British-looking designs on motor scooter far more often, so this was less of surprise. After several nighttime snacks including two local items and one Big Mac, I stopped by a small convenience store to buy a celebratory drink. 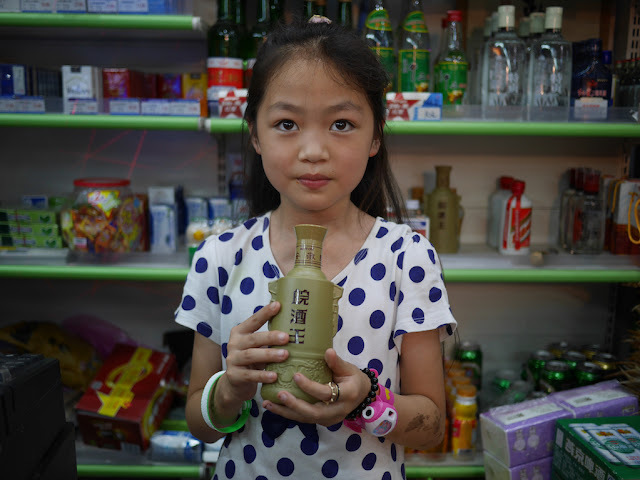 A Bengbu brand of baijiu struck me as a grand idea, and I jokingly asked a young girl who was eager to help whether she liked it or not. With body language playfully suggesting she wasn't exactly telling the truth, she said she did. Her mother (I presume) and I laughed. Good enough. So for 15 yuan (about U.S. $2.20) I bought a bottle of Bengbu Baijiu — not its name based on the Chinese (皖酒王), which more emphasizes its Anhui roots, but I like how it rolls of the tongue. During a discussion with the taxi driver as I headed back to my hotel, I wasn't surprised to learn she didn't know July 4 had any significance in the U.S. But I was a bit surprised when she said she liked drinking this brand of baijiu. And I gotta say, as far a cheap baijiu goes I found it to be pretty decent. I didn't finish it though. I had more explorations planned for the Fifth of July.